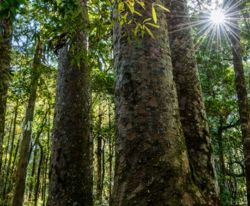 A night walk through the mighty Waipoua Forest is an enchanting way to experience the affinity that early Maori had with the forest & the deep spiritual respect they hold for the giants still growing there. 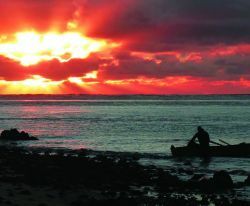 Stepping into this special world you will be walking under the same southern stars that guided our ancestor Kupe from legendary Hawaiiki to New Zealand. On the paths of the forest meet trees that were already giants before his arrival. With native forest on one side & a white sand dune harbor on the other, an outside evening cocktail of slow dancing will be mystical & never forgotten. This last night in Northland will be super special guaranteed! 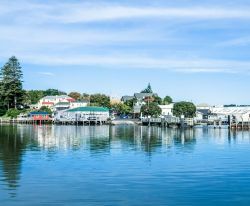 The Kauri Coast runs from the town of Brynderwyn up to the Hokianga Harbor. 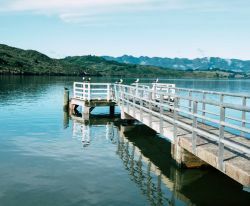 Famed for its giant kauri trees, stunning beaches and significant Maori and pioneer history, the Kauri Coast and Hokianga region is steeped in spectacular natural wonders which will marvel you! 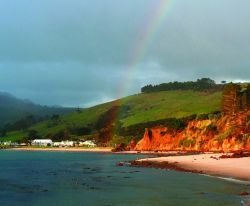 Be prepared to see a change in scenery as we cross over by car ferry to the West Coast known for its rugged landscape. A tranquil farm invites you to share their discovery of the Wairere Boulders in their geological nature park. 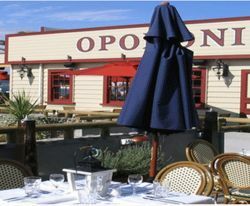 With its magnificent harbor views, the Opononi Hotel hosts lunch. The menu is made up of Northland’s specialty produce so you can capture the taste of the region in this ambient atmosphere. 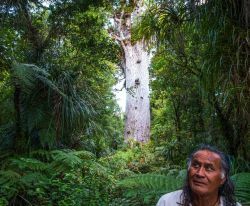 Meet Tāne Mahuta a giant kauri tree (Agathis australis) in the Waipoua Forest of Northland Region, a Forest Sanctuary abounding with rare New Zealand flora and fauna, mighty kauri, nocturnal kiwi and feather-like ferns. Its age is unknown but is estimated to be between 1,250 and 2,500 years. Step into this world with local Maori guides for an unforgettable night journey of story-telling, Maori song and interactive interpretation. Hear the secrets of this spiritual forest. 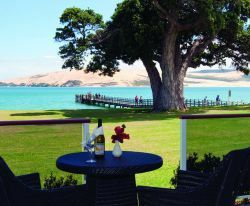 Breathe in your final moments in the Northland as you slow dance to soft music on the Hokianga Harbour’s edge with a backdrop of the sun setting against the white sand dunes belonging to a place where more than 1000 years before, Kupe the first to arrive in New Zealand danced. Dine with delight on the magnificent wrap around deck captivating these glorious harbor water sunsets. Relaxed dining on local delicacies that will boast your taste buds while indulging in Northland wines will more than suffice. Your accommodation lies right on the harbor's water edge where dancing in the sunset during cocktail hour is dreamy and romantic. We pride on making this night truly special for you at the Copthorne Resort.